In the earlier part of his life, he worked primarily in business – first in his father’s foundry, then running a cigar-box manufactory with his brother William in what is now Cambridge, Ontario. In 1884, they moved the business to London, Ontario, the centre of the provincial cigar industry. London became Beck’s base until his death. 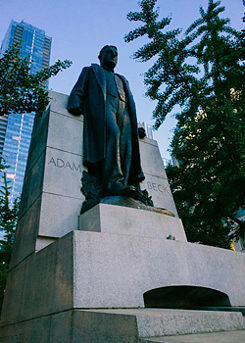 Adam Beck Memorial in Toronto | © Goethe-Institut Montreal After getting married in 1898, Beck became much more involved in public life, eventually turning over management of his business to his other brother Jacob. He ran for mayor of London in 1902 and won, remaining mayor until 1904. His time as mayor was marked by reform, and he was quite a popular politician, becoming MPP of London as well. As mayor, he became aware of the possibility of Niagara Falls as a source of hydroelectric power. Feeling that no company should profit at the expense of the public from control over this power source, Beck advised the province to generate and sell power itself. This suggestion ended up being implemented and Beck was made the chairman of the new Hydro-Electric Power Commission of Ontario, the world’s first publicly owned utility. To this day, hydroelectricity is a major source of power in Ontario. Adam Beck Memorial in Toronto | © Goethe-Institut Montreal Not only was Adam Beck the son of German immigrants, but the sculptor of this monument, Emmanuel Hahn, was also German. Hahn was born in Reutlingen in southwest Germany in 1881. He immigrated with his family to Toronto in 1888, where he grew up. After studying modelling and commercial design in Toronto, he moved to Stuttgart for three years, where he further studied art and design and apprenticed with a sculptor. 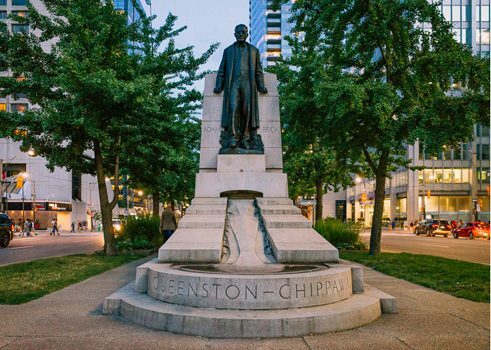 He moved back to Toronto in 1906, where he spent the rest of his life. Hahn’s reputation as a sculptor grew particularly after World War I, when he established himself with his designs for war memorials. He won the 1925 competition to design Winnipeg’s cenotaph commemorating its dead after the First World War. Unfortunately, the public protested the commission going to someone of German origins, so Hahn was paid for his work and a second contest was held to find another design. This controversy served to bring Hahn to national attention, and in 1929 he won the competition for the Adam Beck Memorial, which ended up being his most important monumental project. However, even if you have never seen this memorial, you have almost certainly seen some of Hahn’s work. He was also a coin designer, and his designs for the Caribou quarter and the Bluenose dime are still being minted to this day.